Waterproof Automatically Illuminates Yard Garden LED Solar Power Light is environmentally friendly and low power consumption. 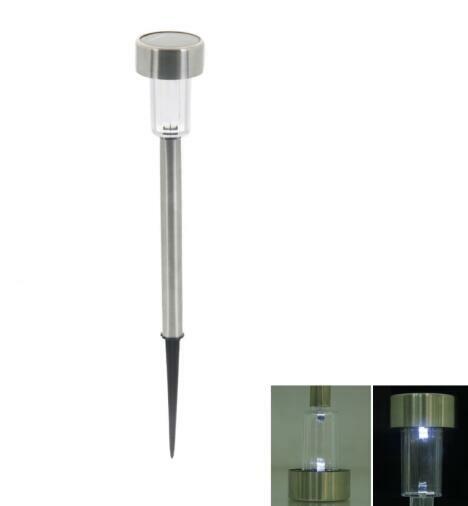 This lawn lamp is made of superior stainless steel, it is durable in use. It features anti-shock, environment-friendly, soft colors and energy-saving. Except that, this product is also a good embellishment for your garden. Imaging that you are drinking and chatting with your dear friends in the dark, how cozy it will be. If you are a romantic host, you should not let this kind of solar lawn lamp pass by. Weather-Resistant: Waterproof IP65,corrosion-resistant and can be used in all weather. AAD Touch Technology: When the solar landscape light is turned on, it will show a star-shaped shadow on the ground, making the night road more unique and beautiful. Easy to Use: Remove the isolator tab under the cap and push the stake into the soil. The solar path lights automatically turn on at night and turn off at dawn! Application: Illumination zone is 1m2-3m2. Perfect for any path. Decorate your home’s driveway, walkways, garden paths, decks and patios. Warm Tips: Please turn on the switch to make sure that the light can be charged effectively in the daylight.